Simplya Smart is the APP for Android Smartphones compatible with Smartweb network interface (DSL connection with public static IP address or with DDNS service is necessary) for an integrated management of Anti-theft, Home automation and Video surveillance functions. Simplya Smart Android is able to manage up to two Combivox control panels through a permanent connection (h24). In this way, the APP permits to receive the system status, alarms and special signallings on event through instant PUSH notifications. It is possible to manage up to 16 ONVIF 2.0 IP cameras for the live visualization and the exclusive VIDEO ALARM function: indeed, it is possible to associate the alarm zone to the cameras. 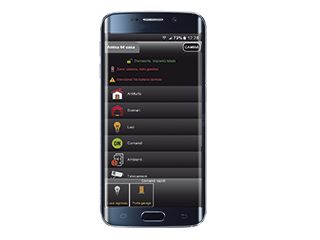 In case of control panel event the APP is immediately able to view the camera of the alarm zone and to record up to 30 second-video directly on the Smartphone memory (function available except for certain restrictions of the Android version installed).